FAIRFIELD — What a spring it was. The town’s four high schools — Ludlowe, Warde, Prep and Notre Dame — spring sports teams put together very successful seasons across the 11 programs that took place. Of the 36 teams, 24 posted winning records and participated in the CIAC tournament. Among the highlights: The boys’ lacrosse team, the boys’ tennis team and the boys’ golf team at Fairfield Prep all won the Southern Connecticut Conference (SCC) tournaments while the Warde girls’ golf team placed third in the FCIAC tournament and captured second place in the State Open. The Warde boys’ and the Ludlowe girls’ track teams went undefeated in the regular season and won the FCIAC East Division titles. Fairfield Prep went 16-4 in the regular season and reached the SCC championship game before falling to Amity. The Jesuits defeated Greenwich and Newtown in the opening two rounds of the Class LL tournament before losing to Danbury and ending with a 20-6 record. “This team is tough and they believe in each other and believe in the things that they do and they’re a great group to be a part of,” Prep coach Rudy Mauritz said. Ludlowe went through a roller-coaster of a campaign, winning its first five games, only to lose its next five before rallying to win five of its next six and then dropping its last four regular season games to head into the postseason at 10-10. Losing two senior pitchers, Matt Kubel and Zach Day, to injuries didn’t help matters but that only toughened the Falcons’ resolve. Warde stumbled badly at the start, losing its opening six games before winning seven of its last 14 and missing out on qualifying for the Class LL tournament by one game. Notre Dame-Fairfield won its opening five games and stood 11-1 at one point but coach Bill Mazzucco’s team struggled down the stretch, losing seven of its last 10, including a second-round loss to Thomaston in the Class S playoffs. Led by first-team All-FCIAC pitcher Brittany Romero, Ludlowe went 12-8 in the regular season, reached the semifinals of the FCIAC tournament and lost to Amity in the opening round of the Class LL tournament, finishing with a 13-10 records. “Brittany has been our workhorse. Our warrior on the mound,” Ludlowe coach Shari Paci said. Warde got off to a fast start, winning four of its first five games and was 8-3 at the halfway point before dropping six of its last nine to head into the Class LL tournament at 11-9. The Mustangs lost to Glastonbury in the first round to finish with an 11-10 record, a solid achievement considering that coach Gary Quiricone had six sophomores and two freshmen in his starting lineup. Notre Dame-Fairfield also go off to a fast start, winning its first 15 games, thanks in a large part to freshman pitcher Breana Brown. But the Lancers train came off the tracks at the end as coach Jeff Bevino’s team lost four of its last five regular season games, lost to Barlow in the quarterfinals of the SWC tournament and lost to Coventry in the second round of the Class S tournament, ending with a 17-6 record. Fairfield Prep won the SCC tournament title with a 12-8 victory over Cheshire before falling in the second round of the Class LL tournament to Wilton, ending the season with a 16-4 record. 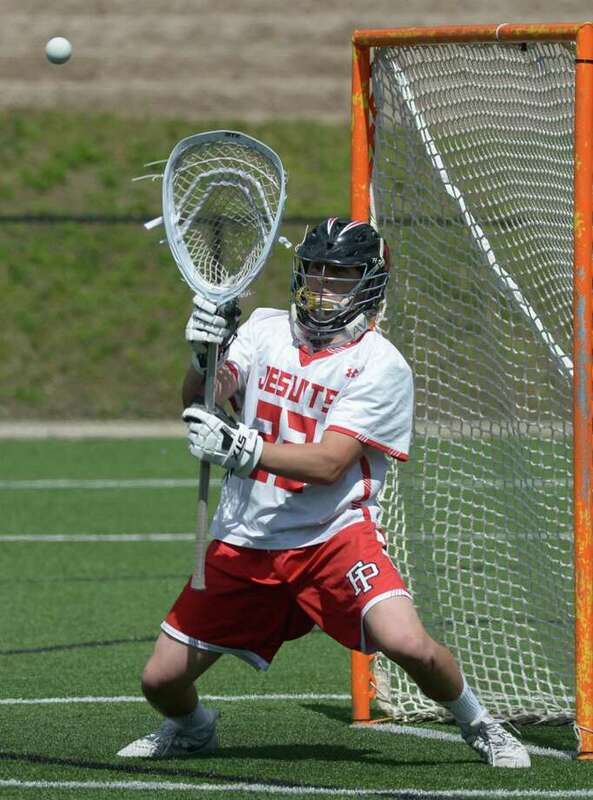 As always, the Jesuits played a stellar schedule, taking on St. Anthony’s (NY), Chaminade (NY), Salesianum (DE) and Fordham Prep (NY), bruising games that prepared them to make their run through the SCC tournament, with goalkeeper Matt Pinho — the tournament’s Most Outstanding Player — leading the way. Ludlowe won three of its first four games for coach Chris Parisi before dropping five of its next six. The Falcons rallied to win four of its last six down the stretch to finish at 8-8 and qualify for the Class LL playoffs. Ludlowe lost to Simsbury by a single goal (12-11) to end with an 8-9 record. Warde, under coach Tom Cunningham, also battled all season to stay around the .500 mark, winning two of its last three games to also finish at 8-8 and make the Class LL tournament field. The Mustangs lost in the opening round to Newtown 13-12 in overtime to also end with an 8-9 record. Notre Dame-Fairfield defeated Trinity Catholic in its opening game of the season and then proceeded to lose 10 straight. The Lancers did manage to win two of their last five games to finish at 3-13 for coach Frank Skawinski. After a 10-1 loss to town-rival Warde that dropped Ludlowe to 1-2 on the season, the Falcons won seven of their next nine to jump to 8-4 and use that momentum to qualify for the Class LL tournament with a 9-7 record. Ludlowe, under coach Heather Lewsey, defeated Danbury 14-12 in the qualifying round and lost to Greenwich in the opening round, ending the season at 10-8. Warde put together a solid season, winning nine of its first 12 games and finishing at 12-4. The Mustangs qualified for the FCIAC tournament (losing to New Canaan, 10-9) and then fell to the Rams in the opening round of the Class LL playoffs, leaving them with a 12-6 mark for coach Tom Davis. Notre Dame-Fairfield managed two wins during the spring, beating Amistad and Holy Cross, finishing at 2-14. One bright spot was the play of Katie Cuifo, who scored over 50 goals for head coach Jenn Schell’s squad. After being a combined co-op team for the last 10 seasons, Ludlowe and Warde separated into separate squads and the Mustangs — under coach Garrett Covino — managed to find a winning formula, finishing with a 10-8 regular season mark. Warde also made the Class LL tournament, losing in straight sets to Staples. Ludlowe, as all new programs do, struggled throughout the season under rookie coach Ryan Mintzer-Woodcock, winning just three times. Fairfield Prep, under the direction of coach Harold Prather, surprised defending champ Hand to win the SCC tournament title. The Jesuits also defeated Shelton and Amity en route to the crown. It was the fourth SCC title overall for Prep, who also captured SCC honors in 2008, 2009 and 2010. The Jesuits finished 17-5 on the season. Ludlowe posted a winning season, finishing at 11-6 under coach Andy Jorgensen. The Falcons qualified for the FCIAC tournament, losing to Staples in the quarterfinals. Warde went 7-9 under coach John Harvey. Led by No. 1 singles Alissa Sangiuolo, Ludlowe put together a 11-5 regular season campaign for coach John Reisert. Xenia Efimov, Lauren Hand and Sandra Reiss rounded out the singles players. The Falcons qualified for the FCIAC tournament, losing to Greenwich in the quarterfinals. Ludlowe defeated New Britain in the qualifying round of the Class L tournament before falling to Greenwich in the first round. Warde went 10-6 under coach Marilynn Jamogochian. The Mustangs also qualified for the FCIAC tournament, falling to Darien in the quarterfinals. Warde fell to Ridgefield in the opening round of the Class L tournament. Notre Dame-Fairfield battled under coach Peter Perillo but finished the season winless at 0-19. Fairfield Prep (313) won the SCC tournament, edging past Xavier (314) by a single stroke at the Race Brook Country Club. Will Mallek led Prep with a 3-over 74, tying for second place overall. Mike Knick shot a 6-over 77, Jack Kane shot an 8-over 79. Evan Farruggio shot a 12-over 83 and Tyler Blose shot 89. The top four scores are used. The Jesuits tied for third in the Division I tournament at Fairview Farms in Harwington, posting a team score of 312. Mike Knick led Prep with a 77, John Kane and Tyler Blose both shot 78 and Will Mallek shot 79. The Jesuits went 14-4-1 in the regular season. Ludlowe, with a team score of 342, placed seventh in the FCIAC championships at the Fairchild Wheeler Black Course. Noah Bass led the Falcons with an 80, Brian Duffy shot 84, Jack Grady shot 89, Keegan O’Reilly shot 89 and Peter Meehan shot 93. The Falcons placed 20th in the Division I tournament with a team score of 371. Brian Duffy shot 90, Jack Grady shot 91, Keegan O’Reilly shot 93 and Noah Bass shot 99 for the Falcons. Ludlowe went 10-8 in the regular season for coach Corinne Halliday. Warde posted a 5-14 record for coach Pete Shanazu. Notre Dame-Fairfield finished the season with a 9-8 record. Safeen Ahmad shot a solid 9-over par 80 to place sixth overall in the SWC boys’ golf championships at Ridgewood Country Club. The Lancers finished eighth in the team standings, finishing with 360 strokes. A.J. Bouvier shot 82 to finish tied for ninth overall. Stephen Paine shot 97, Alex Coppola shot 101 and Andrew Jones shot 103. Warde, under coach Brian Crocker, finished second in the State Open tournament at Tashua Knolls, falling to New Canaan by just six strokes. Jessica Nuzzaci led the way for Warde with an 82, followed by Emily Healy (84), Nadia Caputo (92), Mia Gramesty (96) and Bethany Fell (96). The four best scores are used. The Mustangs 354 total was just six shots behind New Canaan’s winning score of 348. Warde, who went 11-2-1 in the regular season, finished third in the FCIAC playoffs, just behind New Canaan and Greenwich. Ludlowe struggled to a 1-13 record under coach Lindsay Waack. Notre Dame-Fairfield managed to post an 8-7 record for coach Kerri Rowland. Ludlowe went undefeated over the course of the regular season and won the FCIAC East Division title. The Falcons tied for eighth in the State Open meet and placed fourth in the Class LL meet. Sarah Leatherwood placed second in the 3,200-meters in the State Open (10:52.64) while Brianna Auray was sixth in the 800-meters (2:18.99), the 4x400-meter relay team of Paige Davis, Alyssa Kraus, Cassandra Factora and Brianna Auray was fifth in 4:02.78 and the 4x800-meter relay team of Kraus, Davis, Keegan Simonsen and Auray was second in 9:20.52. In the Class LL meet, Sarah Leatherwood won the 3,200-meters with a time of 10:50.17, Maya Mocarski was fourth in the 100-meters (:12.92), Brianna Auray was second (2:16.52) and Alyssa Kraus was sixth (2:20.69) in the 800-meters, Nora Skozcen was fourth in the 100-meter hurdles (:15.74) and was sixth in the 300-meter hurdles (:47.54), the 4x400-meter relay team of Davis, Kraus, Factora and Auray took second place in 3:59.65, the 4x800-meter relay team of Kraus, Davis, Simonsen and Auray were third in 9:23.09 and Kaleigh Boyle was fifth in the javelin at 101-feet. Warde finished tied for 29th in the State Open meet. Gabi Galletta was third in the 3,200-meter run at the State Open, finishing in 10:57.59. The Mustangs tied for 17th in the Class LL meet. Galletta finished fourth in the 1,600-meters in the Class LL meet with a time of 5:11.25 and placed second in the 3,200-meters in 11:15.33. Jasmine Conduoh was ninth in the high jump at 4-feet, 10-inches. The Warde boys team finished the regular season undefeated and won the FCIAC East Division championship. The Mustangs placed fourth in the Class L meet and were 11th in the State Open meet. Andrew Mocarski was second in the State Open 1,600-meter run with a time of 4:17.68, Will Brisman won the 3,200-meters in 9:16.04. In the Class L meet, Brisman won the 3,200-meters with a time of 9:23.51 with teammate Alex Mocarski second in 9:26.13. Mocarski won the 1,600-meter run in 4:19.04. Qasim Danazumi was sixth in the 200-meters in :22.83, Tobias Hernandez was eighth in the 400-meters in :51.27, Joey Ciccarelli was fifth in the 800-meters in 1:59.64, David Harvey was fourth in the 110-meter hurdles in :16.00, the 4x100-meter relay team of Danazumi, Hernendez, Tyler Llewellyn and Joel Urizar were fifth in :44.46. The 4x400-meter relay team of Hernandez, Ciccarelli, David Harvey and Danazumi were seventh in 3:30.96. Harvey placed fourth in the triple jump at 42-feet 3½-inches. Fairfield Prep’s Drew Thompson was second in the State Open 3,200-meters with a time of 9:17.46. In the Class LL meet, Ian Emery was ninth in the 200-meters in :23.59, John Gnibus was 10th in the 400-meters in :52.05 and Drew Thompson won the 3,200-meters with a time of 9:17.57. Drew Newcomb was ninth in the 1,600-meters in 4:31.85. Joe Schanne was third in the javelin with a toss of 159-feet, 6-inches and the 4x100-meter relay team of Ian Emery, Davonte Shaw, Doug Harrison and John Gnibus was ninth in :44.68. Ludlowe finished 10th in the Class L meet and placed tied for 54th in the State Open meet, thanks to an eighth place finish (8:00.43) finish by the 4x800-meter relay team of Colin Agosti, David Bates, Ben Ertel and Ian Bartlett. In the Class L meet, Bartlett won the 800-meter run with a time of 1:57.68. The 4x400-meter relay team of Tad Godlewski, Ben Ertel, Colin Agostisi and Ian Bartlett were sixth with a time of 3:30.54. The 4x800-meter relay team of Agostisi, Bates, Ertel and Bartlett won the race in 8:01.10. Jackson Hemphill was fifth in the pole vault at 12-feet, 6-inches and John Davis was fifth in the shot put at 45-feet, 8½-inches. Notre Dame-Fairfield was tied for 65th in the State Open meet. The Lancers were tied for 23rd in the Class S meet. Dylan Wade was second in the Class S in the high jump at 6-feet, 2-inches and finished eighth at the State Open meet at 6-feet.